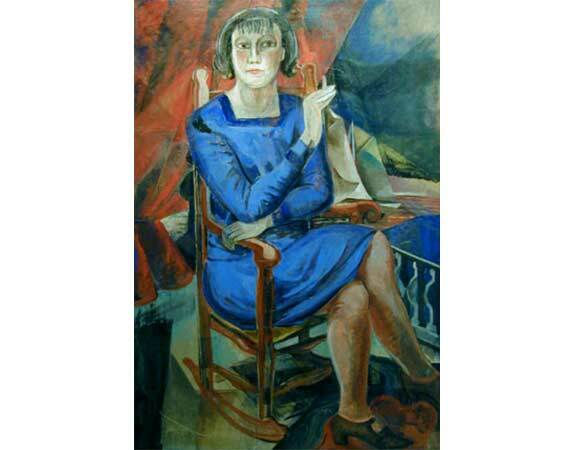 Marguerite Zorach, Portrait of Bea Ault, c.1920, oil on canvas, 44 ¼ x 30 ¼ inches. NEW YORK.- Gerald Peters Gallery New York announces A Life in Art, an in-depth retrospective of works by Marguerite Zorach (1887-1968) on view at the Upper East Side gallery from May 3 through June 8, 2007. Often shown in group exhibitions, this will be the first solo show of Zorachs work in over 30 years. The exhibition will feature 25 oil paintings, including her celebrated landscapes and portraits. Zorach was greatly influenced by the Fauvist painters she was exposed to while studying in Paris from 1908-1912, and became an early advocate of modernism in America. Much of her work features the brilliant color, simple lines and flat perspectives characteristic of Fauvism, yet Zorach also experimented with Cubist forms, and found ways to combine these often opposing styles in her work. While she spent her winters in New York City, her summers in Maine served as an inspiration for many of her nature and landscape paintings. and served as the first president of the New York Society of Woman Artists in the early 1920s. After the birth of her children, Zorach experimented with printmaking, tapestries and textiles using vibrant embroideries, prints and batiks, and became an outspoken supporter of craft as a legitimate art form. Marguerite Thompson Zorach was born in Santa Rosa, California in 1887 and briefly attended Stanford University before traveling to Paris, where she attended La Palette, studying art in the Post-Impresionist style. She and her husband moved to New York City in 1912 where they remained for over 20 years. In 1964 Zorach received an honarary doctorate from Bates College. Her work is in the permanent collections of dozens of museums including the Museum of Modern Art and the Whitney Museum, both in New York. An opening reception will be held at the gallery on Thursday, May 3, 6  8 p.m.